For the first eight years after Elvis returned from the army, he made movies and records but did no live performances. About: Elvis plays Tulsa McLean, an army tank crewman from Texas whose dream is to open his own nightclub with his buddies, who are part of his singing act. On leave in Germany, he places a bet with his fellow soldiers that he can spend an entire night with ‘ice princess’ a hard to get entertainer played by Juliet Prowse. Side notes: The 1st Medium Tank Battalion, 32nd Armored was Elvis’ regiment when he was in the Army with the 3rd Armored Division in Germany, so it was used for the film. 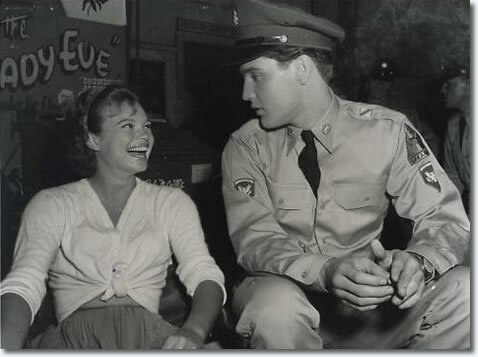 Also, just my opinion, Juliet Prowse was not nearly pretty enough to play the role of a sought after beauty who turned Elvis’ world upside down. A scuffle breaks out and Elvis goes up to First guy who is snapping his fingers to the song. Elvis snaps along with him for moment, then punches him and a brawl ensues. Ha! He punches the guy for playing HIS song. 🙂 Love it. About: Elvis plays Pacer Burton, a half breed Indian who is pulled between his white blood and his Indian blood. When a neighboring family is massacred by the Indians, hostility and mistrust among friends causes trouble for Pacer and his family. This movie took me by surprise. I mean, I’d seen it before, quite a few times, but not in years and years. I didn’t remember loving it as much as I did this time. It was a well-acted, moving, and intense western. Elvis did an excellent job in the role. I cried, a lot. Very sad and emotional. I highly recommend it. Side note: Elvis was inducted into the Los Angeles Indian Tribal Council for his role in the movie. Barbara Eden co-starred, but she was actually the love interest of Elvis’ brother. The movie poster is misleading. About: Elvis plays Glenn Tyler, a young man with a troubled past and an alcoholic father, who dreams of being a writer (pretty cool, right?). 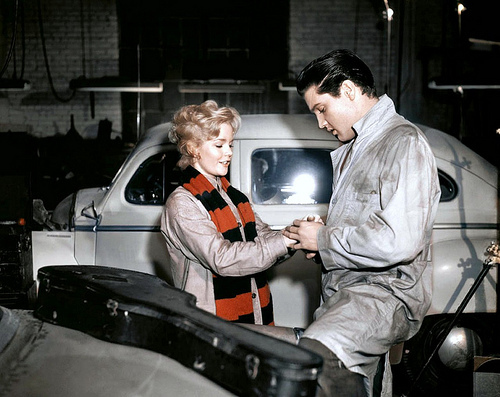 He beats up his brother (played by Elvis’ long-time friend, Red West) in the beginning of the movie and is sentenced to probation and ordered to weekly counseling sessions with Irene Sperry, played by Hope Lange. He also moves in with his uncle, who wants to marry him off to his daughter, a single mom and wild girl, played by Tuesday Weld. Elvis actually has three love interests in this movie, the third being his longtime girlfriend, played by Millie Perkins. Again, I cried in this movie. Elvis does a wonderful job in this role, and it’s very dramatic and moving. Side notes: Millie Perkins broke her arm when she had to slap Elvis’ character. The scene was not used in the movie. At the end of the movie, Hope Lange’s character, after rumors of an affair with Glenn and the threat of Glenn going to prison for murder, attempts to kill herself. In the original ending, she succeeds, but that was not received well, so it was changed. 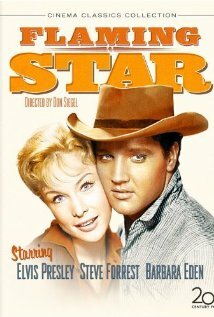 Hope Lange played the ‘older woman’ Glenn fell in love with, but in actuality, Hope was only 13 months older than Elvis at the time. And, finally, Christina Crawford, daughter of Joan Crawford and author of Mommie Dearest, played a small role in the movie. Glenn gets drunk and goes with Tuesday Weld to Irene Sperry’s house, demanding that she return his story to him. He ends up spraying down her porch with the water hose while shouting at her to give him his story back. . It’s a very cute scene, with a touching moment. He was so adorable. About: Elvis plays Chad Gates, who has just returned to his home in Hawaii after two years in the army. His wealthy parents want him to join the family pineapple business, but Chad wants to be independent and he takes a job as a tour guide. This movie was one of Elvis’ most popular, but it wasn’t one of my favorites, strangely enough. I enjoyed it, don’t get me wrong, but not as much as I did many of his others. I think it was partly because I wasn’t crazy about the music in the movie (even though the soundtrack spent 20 straight weeks at #1 on Billboard’s top LP’s and was Elvis’ most successful album) Yeah, I just don’t usually seem to go with the opinion of the masses. Also, there was no romantic conflict. He returned home to his girlfriend and they were together in the entire movie, with a few minor road bumps along the way. Joan Blackman played his love interest, and she was gorgeous. Side notes: At the beginning of the movie, Chad is deplaning and if you listen carefully and turn up the volume, you can hear hundreds of screaming fans who were watching the shoot. Angela Lansbury played Elvis’ mother, but she was actually only nine years older than him. I always enjoy reading your recollections about Elvis. You do love him! Your comment about Angela Lansbury playing Elvis’ mother reminded me of another part she played, the mother in The Manchurian Candidate, where she was only 3 years older than her “son”. YES, I really do love him. It’s a real, true love, not just a celebrity fan crush. 🙂 Wow, I did not know that. I bet she loved being cast as a mother to guys almost her age. Thanks, Alicia–you got me wanting to leave work, make popcorn and hot chocolate, and veg out on the couch all day watching Elvis movies. But no, here I am, stuck behind this secretarial desk in my office! Great job bringing these films to life for me. I really do plan to check them out soon–especially Flaming Star. It sounds fascinating. And that Jukebox scene in GI Blues sounds hysterical! One thing I love about great movies, is that they make me to want to write great stories. No wonder you’re such a great writer. Ha! Yes, I want to do the same! I’m glad you felt I brought them to life. I forget, between viewings, how much I really do love to just watch him. His movies actually make me happy. Weird, huh? Awwww, you’re so sweet! Yes, great movies do make you want to write great stories. You’re an excellent writer yourself, thanks, hon! Well, Alicia, you must know I’d pick Blue Hawaii as a fave. Loved all the music and I remember the scene where he’s lost his car keys and they tear up the beach trying to find them (don’t know why that sticks in my feeble brain). Thanks for another super Elvis-fan post! LOL, well, a lot of people would pick that as their favorite. I’m a bit of an odd duck. You are SO welcome. Thank you for stopping by!